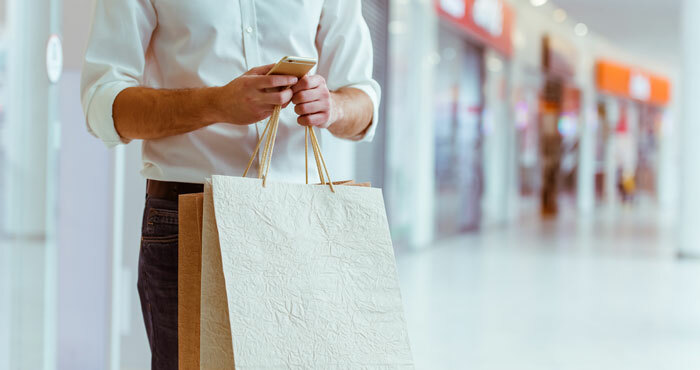 With countless shiny tech toys available to tempt your credit card, how do you separate what you need from what you want? That $1,500 4K OLED television may seem like the perfect addition to your entertainment center, but it may not fit your budget—especially when you're likely to find a $500 model that will meet your television needs. But high-tech doesn't have to mean high-price. There are plenty of budget-friendly gadgets that you'll get more use out of than a top of the line television: like our five must-have tech toys under $50. Let's face it, we all need a bit of a pick me up after our alarm clock goes off in the morning. While there are plenty of ways to make coffee, you really can't get any easier than a machine that will make a single cup with the press of a button. (And first thing in the morning, easy exactly what our caffeine-deprived brains need.) But when it comes to the perfect cuppa joe, there's no single right coffee maker. Depending on what you're looking for, one of these coffee makers will be just right. They may not make the best possible coffee—pre-ground, pre-packaged coffee rarely will—coffee makers that use pods guarantee you a fresh cup of coffee with the absolute minimum of time and effort. These makers use a “pod” of coffee, similar to a tea bag, with different coffee makers using different types. This limits you to the kind of coffee you can use because you can only use the coffee that is made in that kind of pod. 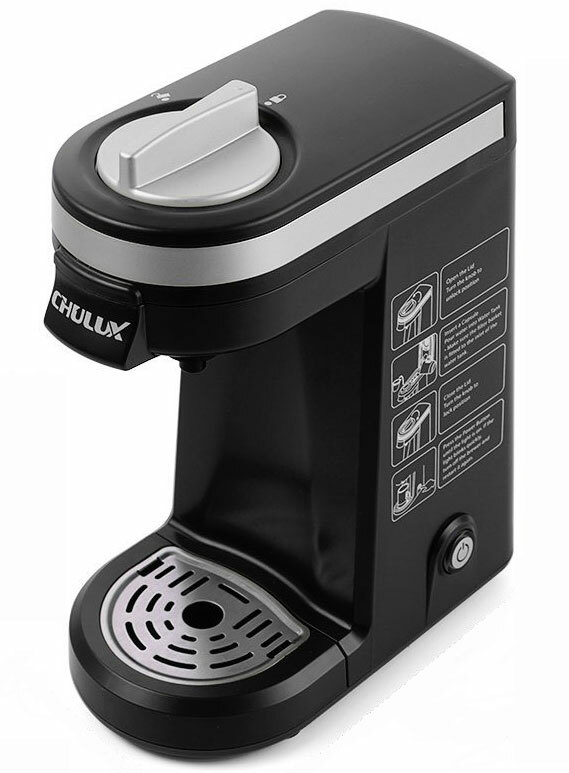 The CHULUX Single Cup Coffee Maker uses K-Cup pods, which start around $0.30 per pod. There are many brands that make K-Cups, including Green Mountian, Starbucks, Dunkin Donuts and Caribou Coffee and you're not limited to coffee. You'll also find cocoa and tea. To make a cup, just insert a pod, put your mug under the spot, press a button and wait. Clean up is just as simple: toss out the pod and put brew basket in the dishwasher. If tossing pods make you feel wasteful, you can invest in a reusable K-Cup filter and use your own grounds. We like the Ekobrew Classic Reusable Filter ($6.95 on Amazon) which can be used with or without a paper liner (300 for $16.49 on Amazon). The problem with coffee pods is that your coffee choices are limited: each type of coffee maker uses its own style of pods and you can only use the coffee that’s produced in those pods. Some single-serve coffee makers accept reusable pods that can be filled with whatever you want, why not just get a coffee maker that lets you use your own coffee from the start? In this category, we like the Hamilton Beach Single Serve Scoop Coffee Maker which lets you use your own coffee—any kind you like—instead of a pod. It’s still a single-serving machine, making a cup at a time, but it allows an infinite choice of coffee to suit your tastes. Once you’ve fed it a scoop of coffee, just put your mug under the spout and press a button to start brewing. The process requires a little more effort than a pod-based brewer, but it’s a great balance between ease of use and drink options. The Hamilton Beach Brewstation Dispensing Coffee Machine makes coffee just like a traditional coffee maker: you measure out your coffee grounds, pour in water, and press a button to make it brew as many cups as you'd like. But instead of using a carafe, the Brewstation stores the coffee (up to 12 cups) in an insulated reservoir, keeping it at the perfect temperature until you put your mug under the spout. This means there's nothing to fumble with and you can fill your travel mug one-handed while you're on the way out the door. It's ideal for households with multiple coffee drinkers who still want the convenience of a quick single cup—perfect for any family that’s often on the go. Paying for a pricey cable plan is becoming increasingly unnecessary with the proliferation of online streaming services. The streaming world has gone beyond Netflix and Hulu with premium options like HBO, Cinemax and Showtime, and ESPN access through Sling TV. Now that you can get almost anything you want online, there’s no reason not to cut your cable bill in half by signing up for streaming services—and picking up a streaming media player to get all of that entertainment on your television. With the low cost of streaming media players, there's no reason not to have one these days—even if you aren’t a cord cutter. A good player makes it simple to get Netflix, Hulu, YouTube, Amazon, HBO and tons of other entertainment options up on your big screen to watch in crisp high definition. While any streaming media player will get mainstay streaming services to your television, the Roku Streaming Stick is our favorite. Not only does it offer more channels than any other streamer, it also has a search function to find the movies and shows you want (no matter what service they're streaming on), an app that turns your smartphone into a remote and lets you send video and pictures directly to your television, and the ability to watch in privacy by plugging headphones into your smartphone (when using the Roku app). It's an entertainment investment well worth $50. Ordinary $2 toothbrushes have served you well so far, so why switch? Because electric toothbrushes are better than brushing by hand. These high tech brushes have been shown to remove more plaque—up to 21 percent. Perhaps more importantly, electric toothbrushes make sure you brush for the recommended two minutes—and despite our best intentions, it’s easy to do a quick brush and then wash our toothbrush off thinking it’s enough. Combined this can make for much better oral health. We like the Philips Sonicare 2 Series for its ultrasonic technology that delivers 31,000 brush strokes per minute—and though that sounds like a lot, it does a gentle job of keeping your teeth and gums clean. Even though that’s a lot more brushstrokes than you’d do by hand, it still times a full two minutes of brushing, ensuring a thorough clean. The Sonicare Series 2’s rechargeable battery lasts for up to two weeks on a charge, so you can take short trips without lugging around your charger. Comes in black, white and pink. If there's one thing all of us can agree on, it's that our smartphones don't last nearly long enough on a single charge—sometimes not even long enough to keep going for a single busy day. But with a portable battery charger you can recharge your phone (or tablet or almost anything else) on the go. When selecting a charger, we looked for one that is pocketable and able to deliver a 2 amp output (which can handle charging a high-power tablet and rapidly charging your phone) and an LED indicator so you know how much charge is left. 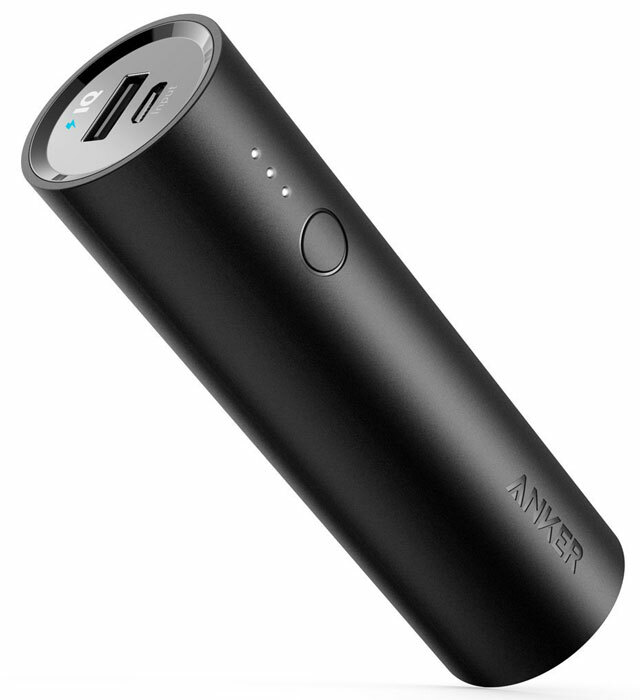 The Anker PowerCore 5000 meets all of these criteria and has is a battery with 5,000mAh of power: that’s enough to charge any phone once and phones like the iPhone 6s twice. If you don't want to have to remember to bring a charging cable, consider the larger 6000mAh Jackery Bolt 6000 ($29.99), which has built-in Lightning and Micro USB cables. No one wants to get stuck on the side of the road with a flat. Usually, that means waiting forever for a tow truck or taking on the time-consuming a potentially hazardous job of jacking up your car and swapping tires. A tire sealant kit, though, can get you back on the road in less than 10 minutes, though you’ll still want to head to the shop to get it repaired or replaced later. Sealant manufacturers claim the sealants are water-soluble, which makes them easy to clean out of your tire when you stop for a permanent repair—just let your mechanic know you’ve used a sealant as a quick fix. 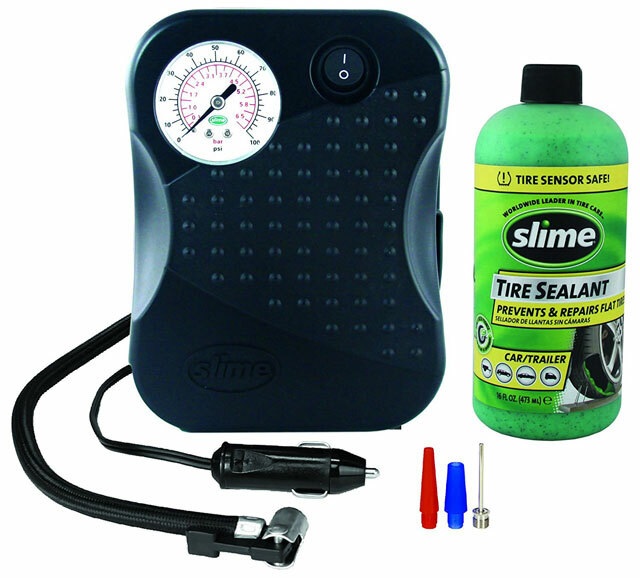 We like the Slime 50107 Smart Spair Emergency Tire Repair Kit, which combines a sealant that can repair holes with an air compressor to re-inflate the tire—all in just seven minutes. If you’re used to carrying both a sealant and an air compressor with you, this gives you one less thing to carry as well as simplifying the repair process. When you find yourself with a flat, just connect Fix-A-Flat's air compressor to your tire and power it up by plugging it into your car's 12-volt outlet. Seven minutes later, you're back on the road—just remember to take your car into the shop for a long-term fix and to buy a new can of sealant so you're prepared for your next tire problem. For frequent travelers, we love the myCharge Hub 9000. It recently won our award for the Best Portable Battery Charger, based on our testing. The myCharge has plenty of power (9000mAh), is reasonably compact and doesn’t require you to carry any extra cables. It’s not the cheapeast unit out there, but for someone who travels frequently, we think it’s an excellent purchase. And what the heck does “pod-based” mean, if anything? “Pod-based” describes the single-serve coffee and espresso machines where the coffee comes in little presealed containers. Keureg, Tassimo, Nespresso are all well-known brands for pod-based coffee. The Hamilton Beach coffee maker uses pods from Senseo. i’m afraid one cup would be like one kiss or one beer lol. I think it is important to mention that sealants put in a tire will clog most low pressure sensors in vehicles. This, depending on your dealer, will void coverage for replacement. Slime claims to be TPMS safe. However, it’s possible that it could clog your TPMS, so it should only be used when you have a puncture and you require an emergency repair (e.g., you’re stranded on the highway or in the middle of nowhere). If your tire is merely low on air or has a slow leak, you can just use the built-in compressor to fill the tire and then go to a tire repair center. Worst case scenario, if you do clog your low pressure sensor, you can buy a replacement for around $40, for most vehicles. $40 for a new sensor is only for some cars. For example, Porsche wants ~$150/sensor last time I checked. Plus cost of dismounting, mounting, balancing. There are some that are safe. Slime didn’t used to be. Haven’t looked at there formulation lately. I have been using a stainless steel Ekobrew k cup for several years. I recently looked for a second one and could not find the same design in stainless steel. Happy to see the BPA free plastic one in the same design if I ever need a new one.